Get ready to get hoppin’ at the Hopped Taco Throwdown! 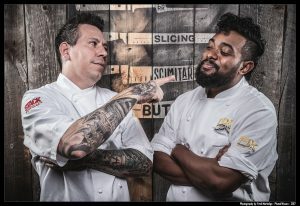 Local chefs throwing down for a good cause, a giant party in Downtown Las Vegas, sounds fun, right? Wait, did we mention the unlimited tacos and beer? in addition to unlimited craft beer samples from all over the US. Tickets are $55 online and $60 at the door. We couldn’t help ourselves, so we tried to get a few details out of Fix’s Chef Sterling Buckley (who will be facing Stack’s Chef Erik Wepfer). He says his inspiration will come from his culinary experiences and the need to always be different. The only thing better than unlimited tacos and beer is unlimited tacos and beer for a good cause! Motley Brews, a group that organizes beer and culture festivals, has raised over $125,000 since they started in 2011 for charities like Goodie Two Shoes and IAVA, and they do it all through festivals like this. Beer and Tacos – Need We Say More?